Hello and Happy Tuesday! I hope you're all doing well. I got to spend some time in my craft room yesterday, in between prepping for classes, I played around with my Stamparatus and I am so excited to share with you the accessory I made to make wreaths from any stamp and my Stamparatus. 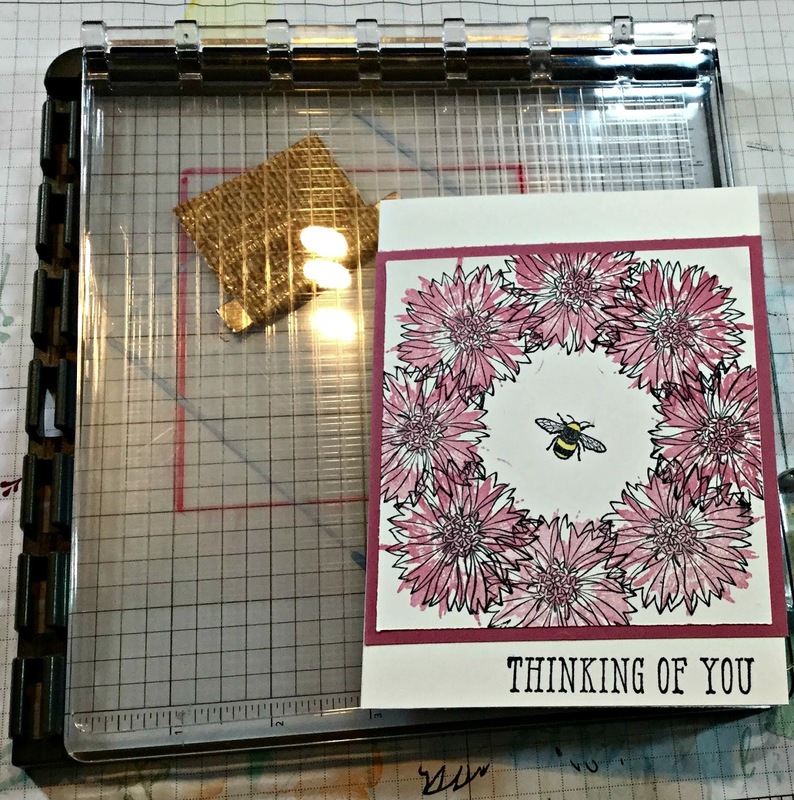 The accessory tool is pretty easy to make when you have the Stampin' Grid paper. I just drew out a 4" square in the center of my grid paper and then traced it into the center of a piece of Window sheet that I cut 6" x 6". You can see it in this photo here. I traced it twice. Once in Cherry Cobbler Stampin' Blend, then I turned the Window sheet "on point" and traced it a second time with my Night of Navy Stampin' Blend. 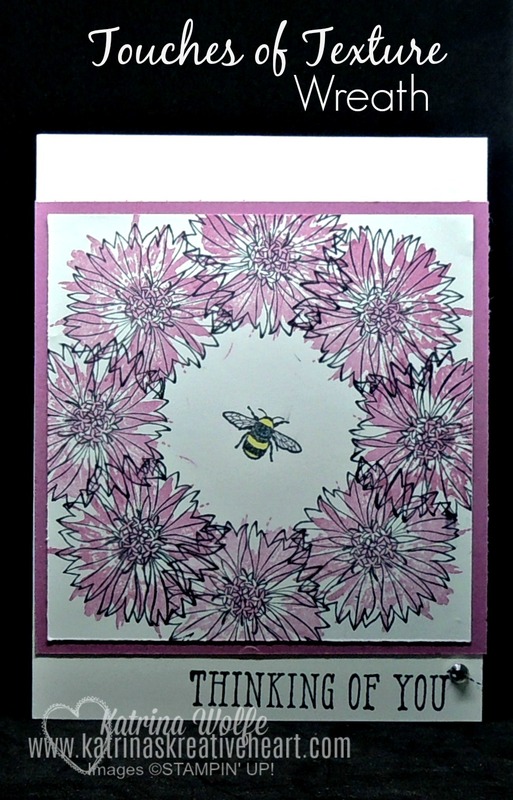 Then I placed this inside my Stamparatus and lined up my 4" square piece of Whisper White cardstock with the square I made in the Stamparatus and stamped my image. Then, I just kept turning the Whisper White paper around lining it up in the squares alternating on point and straight on, stamping the image until I completed my wreath. 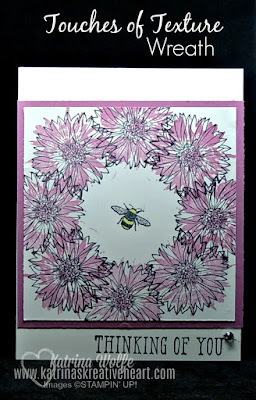 I then went back and added the "splash" of Sweet Sugarplum to the center of the flowers. I layered this piece onto a piece of Sweet Sugarplum that measures 4.25" square and layered it onto a piece of Whisper White cut 8.5" x 5.5" scored and folded at 4.25"
Sadly, the Touches of Texture stamp set is retiring and won't be around much longer. It's an amazing set and is great for adding that "little extra something" to your cards so if it happens to be on your wishlist,now is the time to grab it because after 5/31/18 it will be gone forever and that would be really sad. In addition, the Sweet Sugarplum is also retiring so if these In colors are on you list, don't wait too long as they don't tend to last very long. If you have any questions on how I created my wreath tool for my Stamparatus, please let me know and I will do my best to answer them for you. It's a handy tool to have and simple to make.